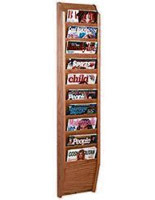 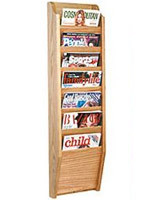 What kinds of wooden magazine racks are available at this website? 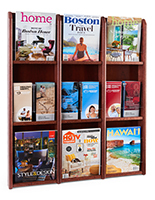 These wall mounted displays are the best organizers for periodicals that you’ll find at these price points. 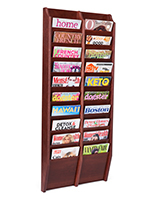 Perfect for office use, these wooden magazine racks are available in a variety of sizes, finishes, and pocket configurations. 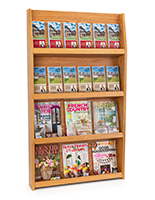 Help guests pass the time in a waiting room at the hospital or in a hotel lobby, or dispense reading material for sale in a store, or available for loan at the library from these wall hanging marketing tools. 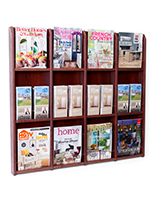 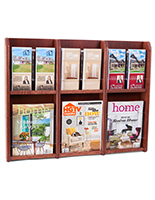 These wooden magazine racks, also known as literature displays, showcase brochure or newsletter-sized publications to promote business. 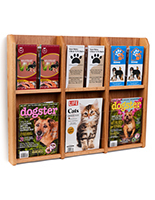 Note that many wares from this website can be same-day shipped when in stock! 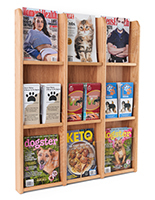 Each of these wooden magazine racks that are wall mounted displays keep floors open for foot traffic, and counters and tabletops clutter-free! 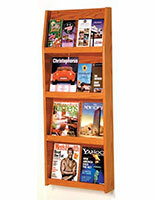 These hardwood fixtures come in different sizes for office pamphlets, catalogs, or other collaterals with many divider configurations. 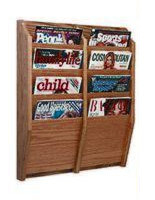 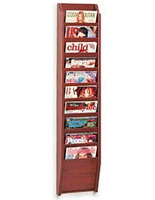 Each of these hanging wooden magazine racks has a fairly pocket for storing a bunch of publications items at a time. 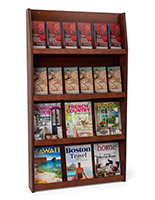 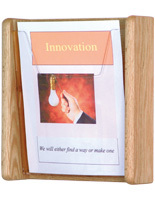 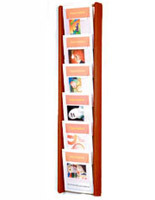 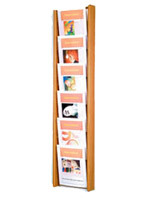 What are some of the features of these wall mounted literature displays for sale online? 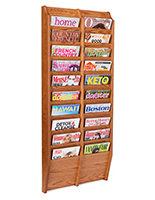 Wooden magazine racks come in beautiful woodgrain styles with lots of pocket configurations for a multitude of professional uses. 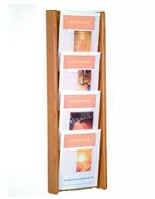 These stands for hanging come in light oak, medium oak, or red mahogany choices, with many models available in all three finishes. The wall mounts come configured with anywhere between 1 and 24 pockets (some have adjustable pegs) for presenting varied sizes of periodicals at a time. 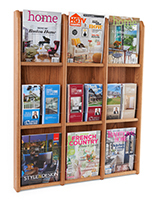 Each of these fixtures have either a wood front panel that keeps titles visible, or an acrylic front panel with full views of the contents. 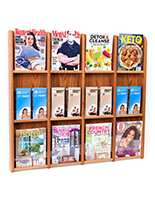 Vertical or horizontal styles are available for varying wall sizes, giving commercial designers and business professionals lots of mounting choices! 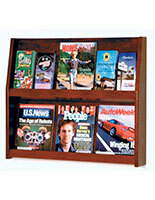 These literature displays come in a myriad of finishes from light and medium oak to red mahogany. 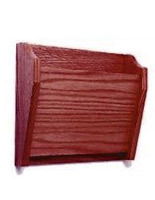 These wall mounted fixtures for a lobby complement other hardwood furniture with thoughtful styling, like acrylic front panels in some cases. 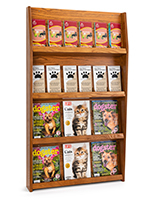 Other literature displays from this collection have wood panels that reveal only the titles of each periodicals or trifolds. 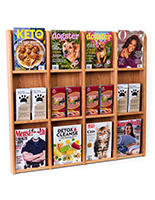 Some of these mounts are adjustable with pins, so a unit with four slots for standard-size newsletters can turn into a unit with eight slots by adjusting the pins. 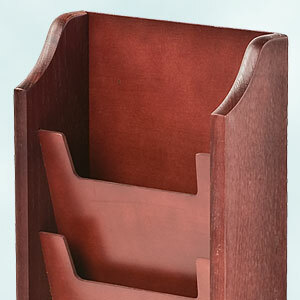 These hardwood fixtures have the proper depth for storing lots of material at once! 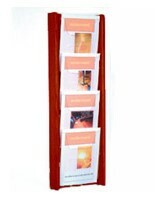 These literature displays with deep pockets can be purchased in bulk for mega-savings in a corporate office building, library, or store! 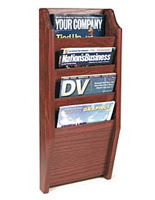 Organize a waiting area with materials for guests to read so they have a pleasant experience while waiting for service - or educate them about your organization with promotional materials! 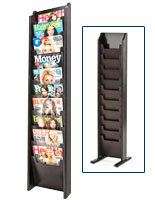 Keep a waiting area free of clutter by using hanging brochure displays with a deep pocket system to keep the office stylish and professional looking. 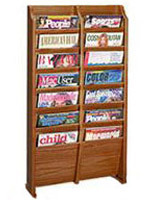 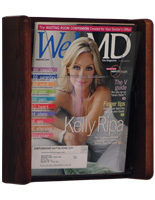 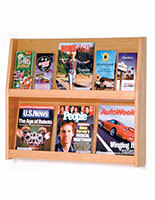 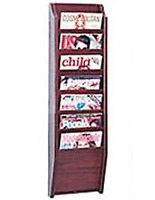 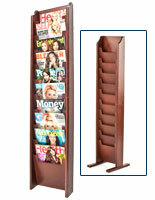 These magazine racks, like pamphlet displays, make company and organizational information accessible to clients. 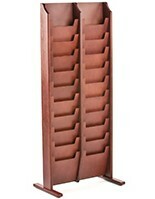 With same-day shipping for most in-stock items, this online store not only has top goods - but fast turnaround! 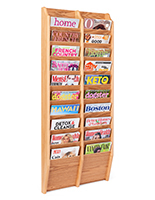 These wooden magazine holders are displays that keep prospective clients informed of new services, and reinforce a brand with collateral materials. 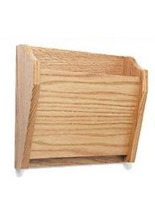 The racks have a beautiful grain finish expected of most high-end office accessories, but economical materials make them affordable! 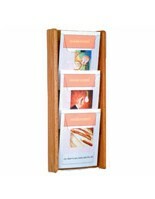 Buy stands like these from this reputable supplier and enjoy bulk pricing. 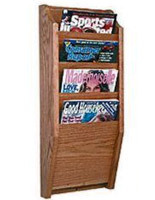 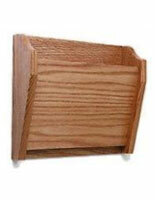 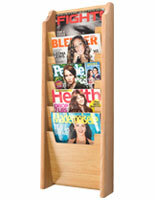 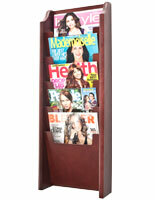 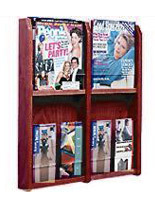 Boost sales and business with affordable wooden magazine holders! 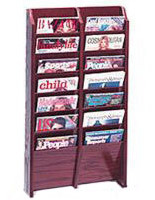 Deep pockets allow bundles of periodicals to be stored and displayed. 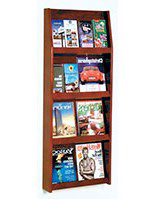 Each of these racks for a magazine is made of durable material that stands the test of time, and attracts customers to your brand or goods for years to come!